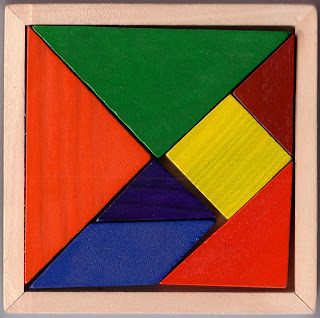 The Tangram is an ancient Chinese game which comprises of seven pieces derived mathematically from a square. The object of the game is to put the pieces together to form something recognisable. The pieces must touch but not overlap, this means that each shape retains its integrity but the whole forms a shape with a specific meaning. Like words in a sentence, almost.